These Custom Imprinted Mixing Glasses and Custom Imprinted Pub Glasses feature any design, message, and imprint colors you choose. We offer four different styles of Custom Mixing Glasses in 16 and 20 ounce sizes, as well as a classic 17 ounce Custom Midnight Blue Mixing Glass. We use a kiln-fired imprinting process at up to 1,200 degrees, which ensures that your imprints are durable and long lasting. Your satisfaction is guaranteed when you order custom glassware from us. Bars, restaurants, clubs, and many other organizations use our mixing glasses. 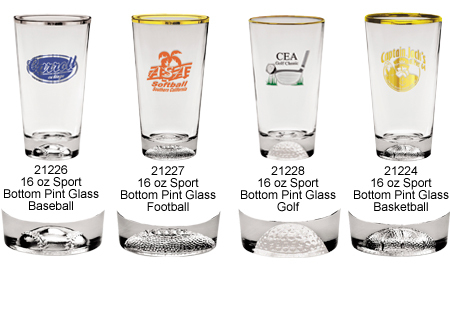 Pricing for Custom Sports Pint Glasses – Call 1-800-233-0828 for more info or to order! 21226 16 oz Sports Bottom Pint Glass (Baseball) $3.02 $2.66 $2.54 $2.46 $2.39 $2.23 2-3/4" 3" 9-1/4"
21227 16 oz Sports Bottom Pint Glass (Football) $3.02 $2.66 $2.54 $2.46 $2.39 $2.23 2-3/4" 3" 9-1/4"
21228 16 oz Sports Bottom Pint Glass (Golf) $3.02 $2.66 $2.54 $2.46 $2.39 $2.23 2-3/4" 3" 9-1/4"
21224 16 oz Sports Bottom Pint Glass (Basketball) $3.02 $2.66 $2.54 $2.46 $2.39 $2.23 2-3/4" 3" 9-1/4"
It's easy to have your own Custom Mixing Glasses. Simply call 1-800-233-0828 and submit your camera-ready artwork to graphics@kardwell.com (you can also mail or fax your art). The minimum order is just 72 Mixing Glasses. You will receive your Custom Mixing Glasses in about 3 to 4 weeks. Rush delivery is available.